How would you like to be finished with clogged toilets forever? What about being free from toilet maintenance? Thanks to American Standard’s new Champion® 4 Flushing System, you might be able to avoid dealing with clogs and/or maintenance forever. With the widest waterways of any toilet in the industry, the Champion® 4 Flushing System by American Standard virtually eliminates clogging and overflowing toilets. Additionally, this new system is virtually maintenance-free, thanks to American Standard’s exclusive EverClean™ fired-in, permanent, antimicrobial surface that repels dirt and is resistant to bacterial growth on all exposed surfaces. American Standard’s Champion® 4 Flushing System is raising the bar for high performance toilets. It features a 4 four-inch opening between the tank and the bowl, which is the largest available opening. 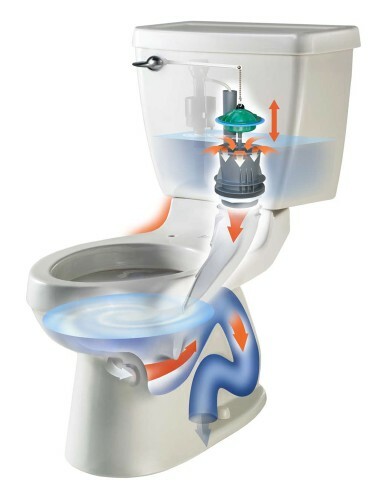 The powerful flushing action pushes water into the bowl up to three times faster than the standard two-inch flush valve and is even one-third faster than premium 3 ¼-inch flush valves. Additionally, the Champion® 4 Flushing System’s fully glazed trapway, which is 3/8 of an inch larger than standard trapway, can move a mass nearly 70 percent larger than what a standard model can handle. It can even move a mass 40 percent larger than it’s closest competitor in the high performance toilet product category. environmentally responsible selection. It has been approved for the new Environmental Protection Agency (EPA) WaterSenseSM label and that flushes on 20 percent less water than standard toilets. The Champion® 4 Flushing System is backed by the American Standard limited 10-year Worry-Free™ Warranty, which covers everything inside and outside of the toilet. For more information, see www.AmericanStandard-US.com.